BAKED POTATOES ARE GREAT OPTION FOR A LIGHT LUNCH OR AN EVENING MEAL. AND YOU CAN ADD LOTS OF GREAT TOPPINGS TO MAKE THEM BOTH TASTY AND HEALTHY. 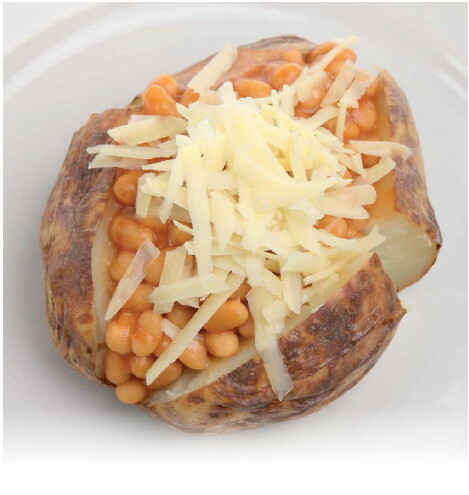 HERE’S OUR IDEA FOR A BAKED POTATO WITH A CHEESE AND BAKED BEAN TOPPING, BUT THERE ARE LOTS OF OTHER TOPPINGS YOU COULD ADD IN (SEE BELOW FOR MORE IDEAS). Great news! The latest issue of Hot English (194) is out now! Learn over 1,000 useful words and expressions and improve your listening skills with Learn Hot English! 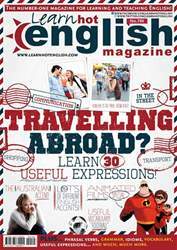 This month: Learn 30 useful expressions for travelling abroad. Plus, 10 useful words and expressions for talking about the body, 12 words and expressions for talking about laying the table, 6 useful expressions for talking about the phone, idioms, phrasal verbs... plus: • Restaurants – the buffet. • Marketing – meerchandising. • Language – how to have fun learning English. • Cinema – animated films. • Sport – football vocabulary. • Hollywood – famous flops. • Vocabulary – the weather. • Football – soccer quotes. • Accents – the Australian accent. • Events – sporting disasters. • Language – Murphy’s law. AND LOTS, LOTS MORE! By reading and listening to all this great content, you'll improve your English reading and listening skills and learn up to 1,000 useful words or expressions. Plus, you'll get a better job and pass English-language exams more easily. Guaranteed! LEARN THESE USEFUL PHRASES FOR TRAVELLING ABROAD!